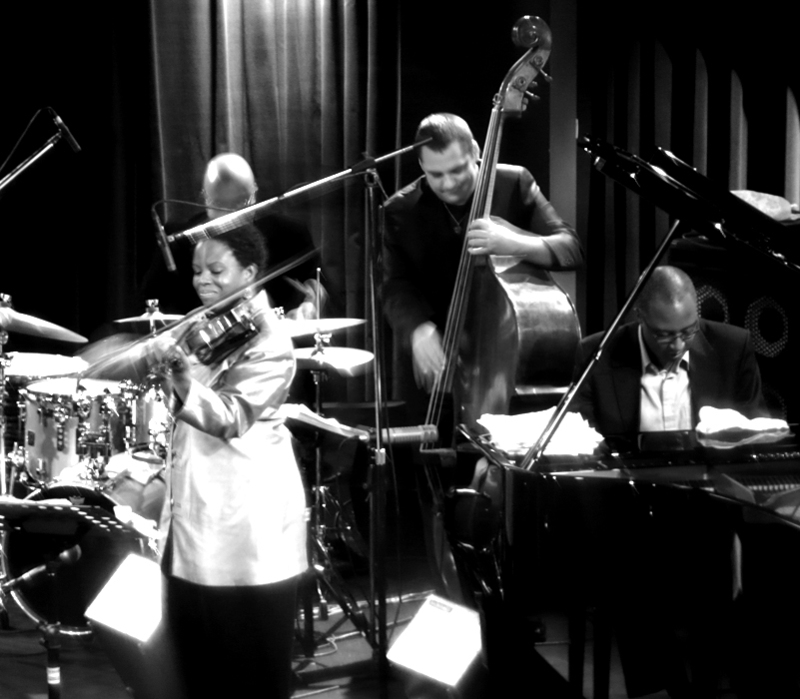 Last night jazz violinist Regina Carter returned to Herbst Theatre to give her ninth main stage concert for San Francisco Performances (SFP). This time she appeared as the second artist in the SFP Virtuosi Series (the first having been violinist Leila Josefowicz, who gave her Herbst recital at the beginning of this month). Later this morning Carter will give her sixth Family Matinee Series presentation. Last night Carter led a quintet whose other members were keyboardist Xavier Davis (piano, Hammond B3 organ, and Fender Rhodes), guitarist Marvin Sewell, bassist Chris Lightcap, and drummer Alvester Garnett. (The quintet will also join her for this morning’s Family program.) The title of last night’s program was Simply Ella, honoring the centennial birthday of Ella Fitzgerald, which took place this past April 25. Carter confessed that she had planned this as the title of the album she is currently preparing until she realized that another album had already been released with that title. Those expecting an evening of Fitzgerald standards may have been disappointed. Carter selected songs that, for the most part, do not get a lot of attention these days, such as “Crying in the Chapel.” Furthermore, the selections were not “all about Ella.” Both Sigmund Romberg and Hoagy Carmichael were represented, and the final selection was an original by Garnett. Furthermore, Carter knew better than to try to evoke Fitzgerald’s vocal style with a violin. If there was any legacy in her execution style, it would more likely be found in the earlier jazz violin work of Stuff Smith. 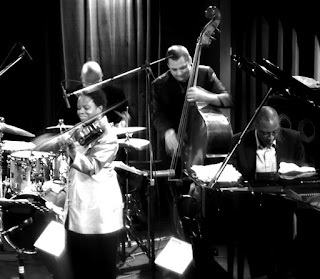 Indeed, Carter acknowledged Smith, since her performance of Romberg’s “When I Grow Too Old to Dream” was inspired by a recording that Smith made with Nat King Cole. For that matter Carter’s approach to portamento, which gives her playing such a seductive jazzy sound, probably owes more to her listening to Smith’s recordings that to her studies at the New England Conservatory of Music. Then, of course, there was her decision to tack on a quote from the English folk tune “Country Gardens” at the end of “When I Grow Too Old to Dream,” which was clearly a nod to Charlie Parker’s fondness for that ditty. Such cross references are a stock-in-trade of jazz improvisation. What distinguished Carter was that, over the course of her one-set evening (lasting around 75 minutes), she was so sparing in those cross references. Having followed her throughout her SFP appearances, I have come to appreciate how she has cultivated her own rhetoric built around her own tropes, being very sparing in the appropriation of others. While she never tries to show off her uniqueness, there always seems to be a fresh originality to her improvisations (and those of her fellow performers) every time I encounter one of her shows. She has definitely found her own jazzy voice, and it is well worth repeated opportunities for attention.